A court is a tribunal, often regarded as a government institution and not personal property, with the authority to adjudicate legal disputes between parties and carry out the administration of justice in civil, criminal, and administrative matters in accordance with the rule of law and not sharia law as obtainable in Justice Binta Nyako's court. It can be seen also as a formal legal meeting in which evidence about crimes, disagreements, etc., is presented to a judge and often a jury so that decisions can be made according to the law, in which case is common law as practised in Nigeria and not sharia law. A judge like Binta Nyako is a court officer authorized to openly hear and decide cases like that of Kanu in a court of law; she is meant to be a magistrate charged with the administration of justice and not injustice like she has displayed. Justice Binta Nyako of the Federal High Court Abuja, on 13th December 2016 made an outrageous assertion to the bewilderment of all present, after Nnamdi Kanu challenged her preposterous ruling to shield witnesses in his ongoing trial when she said "this is my court, and i can do as i please". This foul statement which came as a shock to many shows that Binta Nyako is bereft of what her profession entails. going by the above statement which has left so many people stupefied, it behooves on me to ask Binta the following questions; Was it yourself, Buhari, or the institution that made you a judge that should warrant the introduction of an alien practice to Kanu's case? Did you purchase that very courtroom with Buhari's money or even yours that gave you the audacity to proclaim it your court and that you can act which ever way you choose to, eventhough your actions violate every principles guiding Justice system in Nigeria? Read also:Biafra: As Buhari a.k.a Killer of Biafrans Gears To Jail Kanu, Igbo Leaders Attempted To Desecrate Enugu With His Presence...What A Shame! In the history of law in Nigeria, it is unheard-of that a judge aside his or her duties of presiding over cases presented to him or her in law court, would portray such arrogance by deviating from the rule of law and more so, making obscene statement that the court is hers, hence she can decide to unjustly jail anybody including Nnamdi Kanu so as to please Muhammadu Buhari. 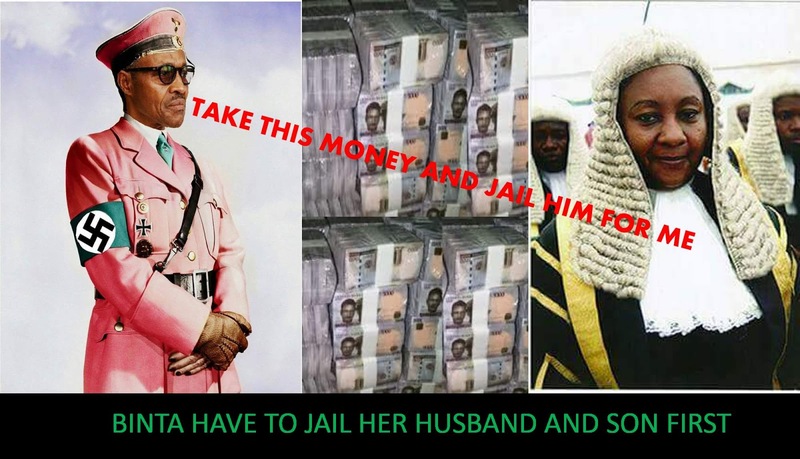 It is appropriate to note that justice Binta Nyako in conjunction with the Department of State Security (DSS), connived with Muhammadu Buhari to deny Nnamdi Kanu bail in order to eradicate the criminal records of her thieving husband, Murtala Nyako and son Aziz Nyako, who were both found culpable in corrupt practices and fraud and currently being probed by the EFCC. Binta Nyako whose family is known for sponsoring terrorism, looting, corruption and embezzlement of public funds succumbed to Buhari's pressure to deny citizen Nnamdi Kanu bail and more bewildering is her approval of secret trial, despite proven not guilty by her colleagues, justice Shuaibu Ahmed of the Magistrate court and A.F Ademola of the Federal High Court, Abuja. Justice Binta Nyako who is known and listed as a lazy and lousy judge at the Federal High Court Abuja, amongst other corrupt judges by the late former president of Nigeria Musa Yar'adua sealed every speculation about her being a corrupt judge by her recent ruling to allow masquerades testify against Nnamdi Kanu in court away from the eyes of the public. The court is a government institution and nobody's personal property. It is a place where people like Nnamdi Kanu deserve to get justice when abused by tyrants like Muhammadu Buhari, therefore he has every right to be tried unbiased and justly by an impartial judge and not Binta Nyako. On behalf of Nnamdi Kanu, we the Indigenous People of Biafra are saying that we will never allow him to be subjected to any charade in form of secret trial that is insidious to himself and the people. Binta Nyako should either rescind her decision to allow secret trial or recuse herself just like her disgraced predecessor, John Tsoho did. The Nigerian court is not a sharia court and hence every legal proceedings is meant to be conducted in the open and not behind the scene. As long as Nnamdi Kanu was openly accused, we Biafra Writers are saying that he must be openly tried. The court was instituted by the government for settlement of disputes, and not to be usurped for personal gain. Buhari should obey court order and release Nnamdi Kanu and other Biafran freedom fighters before 2016 runs out. We will never be part of masked witnesses - period! We will never allow such evil and wickedness to happen to an innocent man. Release our leaders now and avoid unforeseen consequences that will befall Nigeria should any harm happen to Mr. Kanu. I love my Radio Biafra. But could that man who addresses himself as "I am his royal majesty" please stop. He makes the whole programme sound ridiculous. No one in the world, not even the oldest and most powerful monarchs in the world does this.